WHAT…Snow expected. Total snow accumulations of 3 to 4 inches expected. * WHERE…Foster and Stutsman counties. * WHEN…To 6 AM CST Tuesday. impact the morning and evening commute. REST OF TODAY…Cloudy. ssnow in the afternoon. Snow accumulation around1 inch. Chance of snow 70 percent. Highs 10 to 15. East winds 10 to 15 mph. Lowest wind chills around 20 below in the morning. .TONIGHT…Snow. Not as cold. Snow accumulation around 2-3 inches. Storm total around 3 inches. Chance of snow 100. Lows zero to 5 above. Southeast winds 5 to 10 mph shifting to the west after midnight. 15 to 20 mph. Wind chills around 20 below. .TUESDAY NIGHT…Increasing clouds. Lows around 10 below. .THURSDAY NIGHT…Mostly cloudy. Lows around 10 below. 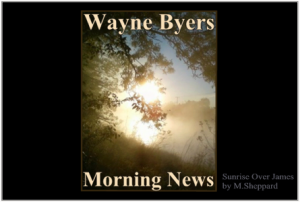 .FRIDAY…Mostly sunny. Highs zero to 5 above. .FRIDAY NIGHT…Partly cloudy. Lows around 10 below. afternoon. Highs 5 to 10 above. .SATURDAY NIGHT…Mostly cloudy. Lows around 5 below. .SUNDAY…Partly sunny. Highs zero to 5 above. open country can`t be ruled out tonight through Tuesday morning. Wednesday night through Thursday night,a chance of light snow At this time it appears that light snow amounts (a few tenths of an inch up to 2inches) are possible mainly along and south of I-94. Jamestown (CSi) Jamestown City crews will begin the full snow plowing program starting with the Emergency routes beginning approximately at 5:00 a.m., Tuesday, February 12, 2019. City crews will begin plowing residential areas at 11:00 a.m., Tuesday, February 12, 2019. Crews will continue work during the night with the Downtown district beginning at 11:00 pm. City Ordinance Section 25-10 requires that a property owner keep the sidewalk adjoining the property clear of snow and ice. Do not deposit snow or ice on the city street after the city plow has cleared the street. These violations are class B misdemeanors under the general penalty and will result in a fine. The above schedule is contingent upon changing weather conditions and snow accumulation totals. Jamestown (JPD) Jamestown Police is investigating the appearance of small blue pills that contain Fentanyl. 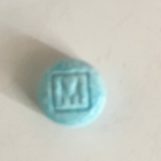 The drugs have a capital “M” on one side and the other has the number 30. 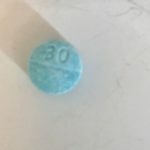 The news release says, the blue pills were seized by law enforcement and then tested positive for synthetic opioids containing Fentanyl, which is 80 to 100 times stronger than morphine. The addictive drug is deadly due to its opioid properties. The pills resemble the prescription medication Oxycodone. Police Lt. Robert Opp says the pill is an illegal narcotic and appear to be made for illegal sales. Anyone who encounters the pills should contact local law enforcement immediately. 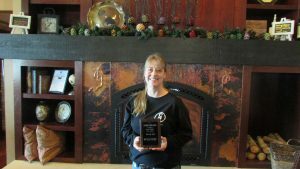 Jamestown (Chamber-YPJ) Members of the Jamestown Area Chamber of Commerce Ambassador Committee and the Young Professionals of Jamestown presented the Customer Service Award for February to Dani Paul of Sabir’s Buffalo Grill for her outstanding customer service. The chamber honors individuals who demonstrate a consistent commitment to delivering products or services that satisfy customers by exceeding their requirements or expectations. Congratulations to Dani, who along with all the other monthly winners, will be recognized at the Chamber’s annual banquet in January 2020. Customer Service Award nomination forms are available at the Chamber office and on their website at www.jamestownchamber.com or call 701-252-4830. Valley City (CSi) The Valley City Public schools parent teacher conferences have been rescheduled Monday Feb 11, 4-p – 9-p. The original date was postponed due to school being closed due to weather issues. Jamestown (CSi) The Jamestown City Board of Adjustment Meeting will be held at the City Hall Council Chambers at 8:00 a.m. – Thursday, February 14. The topic will be a Building Code Variance Request at 1101 15 ½ Ave SW, side yard setback variance. Milling and asphalt overlay in Devils Lake on 1st St NE from 6th Ave to 8th Ave, 8th Ave NE from 1st St to Railroad Ave, and Walnut St E from 8th Ave to Elks Dr.
Storm Sewer installation in Valley City on Wintershow Rd and 8th Ave SW. Pipe replacement on the I-29 crossroad at Exit 212. Pipe installation on ND Highway 20 seven miles north of Jamestown. Lighting, pavement marking and signing on US Highway 83 at the junction of 128th Ave NW at Ruthville north of Minot. Pavement marking and signing in Minot on 3rd Ave SE & 3rd St SE and Burdick Expressway & 13th St SE. Pavement marking and signing in Center on ND Highway 48 & 3rd St and ND Highway 25 near Pope Ave.
Pavement marking, signing, and Dynamic Message Signs on US Highways 2 and 52 from Brooks Junction to south of Velva. Pavement marking and signing on passing and climbing lanes at various locations on ND Highways 8, 22, and 23. Pavement marking and signing on passing and climbing lanes at various locations on ND Highways 8, 22, 23, 200, and 1804. Milling and asphalt overlay on ND Highway 30 from the junction of ND Highway 66 north to the junction of US Highway 281. The public is invited to view the current STIP on the NDDOT’s website at www.dot.nd.gov by clicking on “Publications” on the top of the page, then clicking on the “2019-2022 Final STIP (Statewide Transportation Improvement Program)” link under the Plans and Reports section. Comments should be sent no later than February 22, 2019 to Chad M. Orn at NDDOT, 608 E Boulevard Ave, Bismarck, ND 58505-0700, or sent via email corn@nd.gov with “2019 State Federal-Aid Roadway Projects” in the subject line. Valley City (VCSU) “A Tribute to the African-American Journey”—a traveling exhibit from the True Black History Museum in Troy, Michigan will be hosted in the Student Center lounge on the Valley City State University campus from 9 a.m. to 3 p.m. on Wednesday, Feb. 13. That afternoon, museum founder Fred Saffold III will speak on the African-American experience at 12:30 p.m. in the VCSU Student Center Skoal Room. The exhibit features more than 150 artifacts and original documents dating from the late 1600s through the 21st century from historic figures such as Booker T. Washington, Rosa Parks, George Washington Carver, Angela Davis, Martin Luther King Jr., President Barack Obama, and many other African-Americans. The exhibit and Saffold’s presentation, both open to the public free of charge, are sponsored by the Viking Campus Activities Board and VCSU Residence Life. More information about Saffold and the True Black History Museum can be found online at www.trueblackhistory.com. BISMARCK, N.D. (AP) — North Dakota lawmakers are considering proposals that would make it easier for patients to get doctor approval for medical marijuana. One would remove a requirement that doctors who certify a patient assert that medical marijuana will help that person. Another would add physician assistants to the list of medical professionals who can certify patients. The list currently includes physicians and advanced practice registered nurses. FARGO, N.D. (AP) — North Dakota Gov. Doug Burgum and National Guard leaders honored soldiers from the Upper Midwest who spent about a year serving in Afghanistan.A special ceremony was held Sunday afternoon at the Armed Forces Reserve Center in Fargo for about 30 members of the North Dakota Army National Guard’s 191st Military Police Company. The soldiers are from 20 communities in North Dakota, South Dakota and Minnesota.Burgum said it was also important to recognize and thank the families of the soldiers who spent so much time away. Sgt. First Class Tyson Mattson said his wife held the family together while he was serving.The unit which provided protective service detail and secure transportation while assigned to NATO returned in December. BISMARCK, N.D. (AP) — The University of Mary will open a waitlist for incoming students for the second consecutive year after welcoming a record-setting freshman class last fall. Richard Hinton, the university’s director of undergraduate admissions, told The Bismarck Tribune that the school had 530 freshman students enrolled last fall, and administrators expect enrollment to continue growing. The Bismarck campus will start its waitlist May 1. BISMARCK, N.D. (AP) — North Dakota’s Legislature is marching toward its mid-session break, and lawmakers are finishing up committee work and considering remaining bills in their respective chambers. Many of the major spending bills are still being considered this week in House and Senate appropriations committees as the session heads to “crossover” at month’s end. That’s when legislation that has passed one chamber moves to the other. Highlights this week include hearings on measures that include expanding family farm ownership and a bill to prohibit discrimination based on sexual orientation. North Dakota’s Senate already has rejected a measure this session that would prohibit housing or workforce discrimination based on sexual orientation or gender identity. It’s the latest defeat for an idea that’s gone down several times in recent years in the Republican-led Legislature. A similar bill that does not include gender identity is being heard in the House Human Services Committee on Monday. Gov. Doug Burgum says he supports the bill. He says everyone deserves to be treated equally, and the state needs to think about competing with other states for workers. MINNEAPOLIS (AP) — Democratic Sen. Amy Klobuchar of Minnesota says she’s taking her campaign for president _ and her Midwest sensibilities _ directly to parts of the region Donald Trump won and that her party wants to recapture in 2020. Klobuchar announced her bid Sunday during a snowy rally along the Mississippi River in Minneapolis, where temperatures were well below freezing. Klobuchar said she would travel next weekend to Iowa then make stops in Wisconsin. Joel Embiid (joh-EHL’ ehm-BEED’) had 37 points and 14 rebounds as the Sixers blasted Johnson’s Los Angeles Lakers, 143-120 in Philadelphia. Tobias Harris scored 22 points and JJ Redick added 21 points for the Sixers, who are 2-0 since acquiring Harris and four others at the NBA trade deadline. Jimmy Butler finished with 15 points in helping the Sixers move one game ahead of Boston for the fourth seed in the Eastern Conference. The 76ers had no trouble withstanding Kyle Kuzma’s (KOOZ’-mahz) 39 points for the Lakers. LeBron James had 18 points, 10 rebounds and nine assists for Los Angeles. Philly swept the two-game season series by a combined 39 points. — Kevin Durant poured in 39 points and DeMarcus Cousins made two free throws with 5.4 seconds to complete the Warriors’ comeback from a 19-point deficit in a 120-118 victory against the Heat. Golden State also wasted an eight-point lead in the fourth quarter and trailed 118-115 until Durant drained a 3-pointer with 51.5 seconds to play. Klay Thompson scored 29 points and Stephen Curry added 25 in the Warriors’ 15th victory in 16 games. — Luka Doncic (DAHN’-chihch) scored 28 points and the Mavericks closed on a 21-5 run to pull out a 102-101 win against the Trail Blazers. Tim Hardaway Jr. had 24 points for Dallas, which trailed 96-81 early in the fourth quarter before improving to 20-8 at home. Damian Lillard scored 21 of his 30 points in the last half of the third quarter to help the Blazers build their double-digit lead. — Marvin Bagley III scored a career-high 32 points and had six rebounds off the bench in the Kings’ fifth victory in six games, 117-104 against the Suns. Buddy Hield (heeld) finished with 18 points, while De’Aaron Fox had 17 points and nine assists as Sacramento moved within a half-game of the Clippers for the final Western Conference playoff berth. Phoenix dropped its 14th straight despite Devin Booker’s 27 points, eight rebounds and six assists. — All-Star Nikola Vucevic (VOO’-cheh-vihch) scored 19 points and grabbed 12 rebounds in leading the Magic to a 124-108 victory over the Hawks. Jonathan Isaac and Evan Fournier each had 17 points for Orlando, which didn’t arrive in Atlanta until 2:30am after beating the Bucks in Milwaukee on Saturday. Alex Len led the Hawks with 16 points, despite picking up four fouls in the first half. UNDATED (AP) — Devon Toews (deh-VAHN’ tayvz) scored the game-winner early in the second period and Thomas Greiss (grys) stopped 26 shots to send the Islanders past the Wild, 2-1. Anthony Beauvillier (boh-VIH’-lee-ay) ended an 11-game goal drought and New York won for the 19th time in its last 25 games to open a five-point lead over Washington atop the Metropolitan Division. Minnesota has dropped five of six. Vladimir Tarasenko and the St. Louis Blues remain hot after completing a home-and-home sweep of the Nashville Predators. The Blues squandered leads of 3-1 and 4-3 in the third period before Tarasenko completed a hat trick to give them a 5-4 overtime win at Nashville. He scored four times during the home-and-home sweep to help St. Louis run its winning streak to six games. Blues netminder Jake Allen made 40 saves in his first appearance since Jan. 17. The hot streak puts St. Louis in a tie with Minnesota for the first wild-card berth in the Western Conference. Viktor Arvidsson scored twice for the Predators, who are two points behind the Central Division-leading Winnipeg Jets. — The Jets had dropped three straight before Blake Wheeler’s redirect produced the tiebreaking goal with 3:55 left in Winnipeg’s 3-1 win over Buffalo. Andrew Copp also scored, Mark Scheifele (SHY’-flee) added an empty-netter and Connor Hellebuyck (HEH’-leh-buhk) made 35 saves to help the Jets end their longest winless streak of the season. Jack Eichel (EYE’-kul) scored and Carter Hutton had 26 saves for Buffalo, which is 2-2-1 on its seven-game homestand. — Nikita Kucherov (KOO’-cheh-rahv) scored the first and last goals in the Lightning’s 5-2 win over the Panthers. Brayden Point notched his team-high 32nd goal and had an assist as the league-leading Lightning handed Florida just its third loss in nine games. Steven Stamkos also had a goal and an assist for Tampa Bay, while Louis Domingue (doh-MIHNG’) stopped 25 shots. — Alexandar Georgiev (gee-OHR’-gee-ehv) had a career-high 55 saves to lead the Rangers past the Maple Leafs, 4-1. Mika Zibanejad (MEE’-kah zih-BAN’-eh-jad), Jimmy Vesey (VEE’-see) and Adam McQuaid scored against Toronto as New York ended up 2-2-1 on its five-game homestand. Kasperi Kapanen (kas-PEHR’-ee KAP’-ah-nehn) scored for the Leafs, who had their four-game winning streak snapped. — The Bruins ran their point streak to seven games by beating Colorado, 2-1 on Brad Marchand’s goal at 4:03 of overtime. John Moore also scored and Jaroslav Halak (YAH’-roh-slahv hah-LAHK’) made 35 saves for Boston, which moved to 4-0-3 in its last seven and sent the Avalanche to their seventh consecutive loss. Nathan MacKinnon scored his 29th goal for Colorado. — The surging Blackhawks won their seventh in a row as Dominik Kahun had two goals and an assist in a 5-2 decision over the Red Wings. Dylan Strome (strohm) had a goal and two assists, and Alex DeBrincat (deh-BRIHN’-kat) extended his career-best point streak to eight games with three assists. Patrick Kane scored an insurance goal and had an assist to run his point streak to 14 games. — Marcus Johansson scored twice and Keith Kinkaid made 32 saves as the Devils nipped the Hurricanes, 3-2. Nico Hischier (HEE’-shee-ur) set up all three goals to help New Jersey end Carolina’s three-game winning streak. Dougie Hamilton and Teuvo Teravainen (TOO’-voih tehr-ah-VY’-nehn) scored for the Hurricanes, who remain one point behind Pittsburgh for the second Eastern Conference wild-card berth. DAYTONA BEACH, Fla. (AP) — William Byron has won the pole for Sunday’s Daytona 500, giving Hendrick Motorsports the top starting spot for the fifth consecutive year. Byron and teammate Alex Bowman locked in the front row for “The Great American Race” during qualifying laps at Daytona International Speedway, while Casey Mears and Tyler Reddick secured two of the remaining spots in the Monster Energy Cup season opener. Jimmie Johnson won the rain-shortened exhibition Clash after triggering a wreck that wiped out nearly the entire field at Daytona. ANAHEIM, Calif. (AP) — The Anaheim Mighty Ducks have fired head coach Randy Carlyle following the team’s seventh straight loss and 19th in its last 21. General manager Bob Murray will serve as interim coach for the rest of the season as the Ducks try to vacate the cellar in the NHL’s Western Conference. Carlyle is the winningest coach in Ducks history and led the franchise to the 2007 Stanley Cup and three appearances in the conference finals during his two stints with the team. INDIANAPOLIS (AP) — Free agent guard Wesley Matthews has officially signed with the Indiana Pacers to help fill the void left when All-Star guard Victor Oladipo (oh-lah-DEE’-poh) suffered a season-ending knee injury late last month. Matthews averaged 12.8 points and 2.3 assists in 45 games for the Mavericks this season before going to the Knicks in a trade that sent Kristaps Porzingis (KRIHS’-tahps pohr-ZIHN’-gihs) to Dallas last week. He was dropped by the Knicks before clearing waivers on Saturday. PEBBLE BEACH, Calif. (AP) — Phil Mickelson had a three-shot lead over Paul Casey with two holes remaining with the final round of the Pebble Beach Pro-Am was suspended yesterday. Mickelson was three strokes back before making his big run starting with a 9-iron to a foot behind the cup on the par-4 ninth. That was part of a five-hole stretch in which Mickelson made three birdies and Casey had two bogeys.BOCA RATON, Fla. (AP) — Bernhard Langer closed with a 7-under 65 at The Old Course at Broken Sound for a five-stroke victory in the PGA Tour Champions’ Oasis Championship. The 61-year-old German star birdied five of the first seven holes in a bogey-free round.Langer finished at 19-under 197 for his 39th victory on the 50-and-over tour. He also won the 2010 event and finished second last year.Marco Dawson was second after a 69.ARE, Sweden (AP) — Lindsey Vonn became the first female skier to win medals at six different world championships when she won the bronze medal in the downhill at the world championships in Sweden, the final race of her career. It’s also her fifth downhill medal at worlds, matching the record established by Annemarie Moser-Proell and Christel Cranz. It came five days after Vonn crashed in super-G.
UNDATED (AP) — The 12th-ranked Houston Cougars have now won eight in a row since suffering their only loss of the season. DeJon Jarreau scored 14 of his 16 points in the second half of the Cougars’ 65-58 victory over No. 25 Cincinnati. Jarreau scored 11 consecutive Houston points in the second half, including six straight to give the Cougars a 63-58 lead with 3 ½ minutes left. Jarreau added eight rebounds and five assists as the Cougars improved to 23-1 overall and 10-1 in the American Athletic Conference. Corey Davis Jr. also had 16 in Houston’s 32nd consecutive home win. — No. 20 Iowa stormed back from a 13-point deficit and beat Northwestern, 80-79 on Jordan Bohannon’s 3-pointer with 0.3 seconds left. Bohannon scored his first points with 5:28 to go on a jumper and finished with 15 points with 3-for-4 shooting from 3-point range for the 19-5 Hawkeyes. Freshman Joe Wieskamp scored 21 points including a 3-pointer that was part of Iowa’s comeback with less than six minutes remaining. WASHINGTON (AP) — Budget negotiators will meet Monday to revive talks over border security issues that are central to legislation to prevent key parts of the government from shutting down on Saturday. Talks broke down over the weekend over Democratic demands to limit the number of migrants authorities can detain. The two sides remained separated over how much to spend on President Donald Trump’s promised border wall.WASHINGTON (AP) — On Monday, President Donald Trump holds his first campaign rally since November’s midterm elections. He’ll be in El Paso, Texas, near the U.S.-Mexico border. Weakened by the disastrous partial government shutdown and facing a fresh deadline Friday, Trump is trying to convince people that he’ll continue to push to build his long-promised border wall.RICHMOND, Va. (AP) — A Virginia lawmaker is now suggesting he won’t move forward Monday with plans to introduce an impeachment bill seeking the ouster of Lt. Gov. Justin Fairfax. Democratic Del. Patrick Hope had said he wanted to introduce articles of impeachment Monday against Fairfax after two women recently accused the Democrat of sexual assault 15 or more years ago. He says that after getting feedback from his colleagues over the weekend, he sees that more conversations need to happen before anything is filed.LONDON (AP) — The Associated Press has learned that at least six individuals involved in lawsuits against an Israeli spyware company have been targeted by mysterious operatives who the six claim are trying to discredit them. Two of the individuals are cybersecurity researchers looking into the NSO Group and three are lawyers involved in lawsuits that allege that NSO sold its spyware to governments with questionable human rights records.LOS ANGELES (AP) — This year’s Grammy Awards gave rap artists and women something to celebrate after years of sidelining them. Childish Gambino’s “This is America” became the first rap-based song to win record and song of the year. Duo Lipa won best new artist. Kacey Musgraves won top album and matched Gambino with four Grammys total. And Cardi B was the first solo woman to win best rap album.